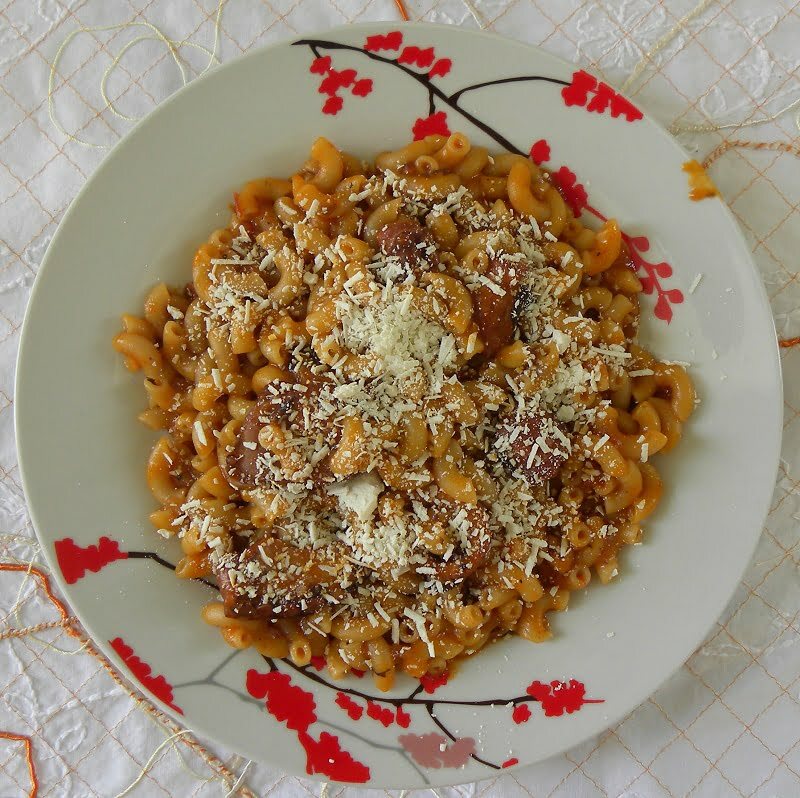 In Greek, htapodi is octopus and makaronaki kofto is a small pasta, like ditali. It is cooked in a tomato sauce and then in the sauce we cook the pasta. It is a Lenten recipe, so during Lent no cheese is added on top. It’s one of the most favourite and filling dishes during Lent. Although rosemary is not added to the traditional recipe, I love adding some fresh rosemary. The fresh rosemary will melt in your mouth so do not add dried rosemary as it’s not the same . In Greece there are many types of octopuses. A cheaper species is called in Greek Moschios (plural moschioi). They are very cheap compared with the common octopus but costs three times less. You know the difference because they are smaller in size and have only one set of suction cups. They can be cooked the same way and taste just as delicious. The octopus must be very carefully washed and dried, and the beak removed. See how to clean octopus an octopus here. Put the saucepan on the heat until it is hot and add the octopus. Mix until it sweats out a pinkish liquid. Keep an eye on it mixing every now and then and cook it in its juices until that liquid has evaporated. Remove the octopus and cut it into smaller pieces about 3 or 4 cm. long. Add oil to the pan as well as the onion and garlic and saute until translucent scraping the pot to clean what’s left from the octopus. Add wine and stir until alcohol evaporates. Meantime, blend tomatoes in a food processor together with the tomato paste and add to the octopus, as well as pepper, bay leaves and rosemary and 2 cups of water. Bring to a boil, reduce heat, and simmer for 1 hour. Remove bay leaves after ten minutes of cooking. When the octopus is cooked, add more water and bring to a boil. Cook the pasta in the sauce stirring from time to time, taste and add salt, if necessary. (I do not add any salt). Serve with Greek feta cheese. Second way to cook it is after the cooking procedure, preheat oven at 180 degrees C, transfer octopus with sauce into a Pyrex or baking pan and add some hot water and cook pasta in the oven for about 20 minutes, mixing a couple of times. Grate myzithra cheese on top. For a Lenten dish, do not add the cheese. Add oil to the pan as well as the onion and garlic and saute until translucent scraping the pot to clean what's left from the octopus. Ivy, a good winter dish for Octopus. I saw some some octopi at the market, perfect for a dish like this.